Updated my previous image with 2 more nights worth of data, for a total of 8 hours now. Much better SNR and I got the dust around M45 I wanted. This is a HDR composit blending shorter exposures for the 7 sisters (brightest stars) and longer exposures to bring out all the interstellar dust. The cluster is mentioned in the Iliad, the Odyssey, the Bible and the Quran among other texts. It was called MUL.MUL, meaning “the star of stars,” in Babylonian star catalogues. The earliest depiction of the cluster appears on the Nebra sky disk, an artefact dating back to 1600 BC, the Bronze Age. In Hindu mythology, the cluster is associated with Murugan, the war god, who was raised by six sisters and developed six faces, one of each of his mothers. The Aztecs based their calendar on the cluster; the Pleiades’ rising in the east before dawn marked the beginning of their year. 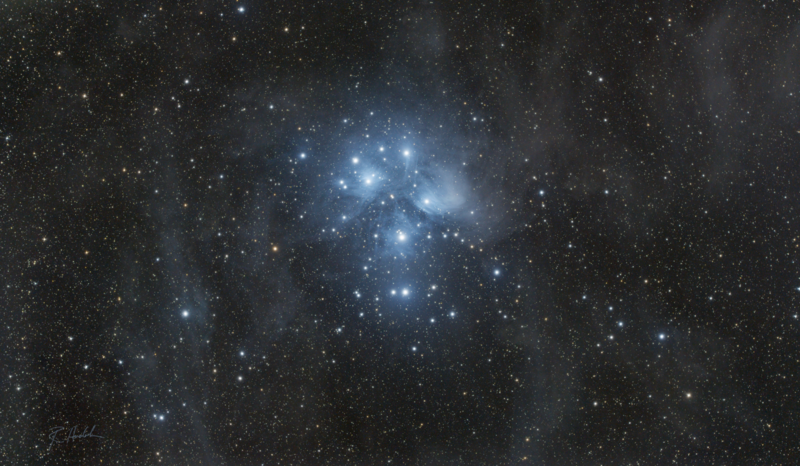 The heliacal rising of the cluster in June also marked the beginning of the year for the Māori of New Zealand.